Stay In Touch With Key Contacts With Contactually | Brand On! Contactually is a new favorite app of mine. It’s a place to store all of your contacts, but most importantly it lets you group them and prioritize follow ups. Think of it as a personal relationship valet. After putting your contacts in different “buckets,” you can specify how often you want to stay in touch with them. 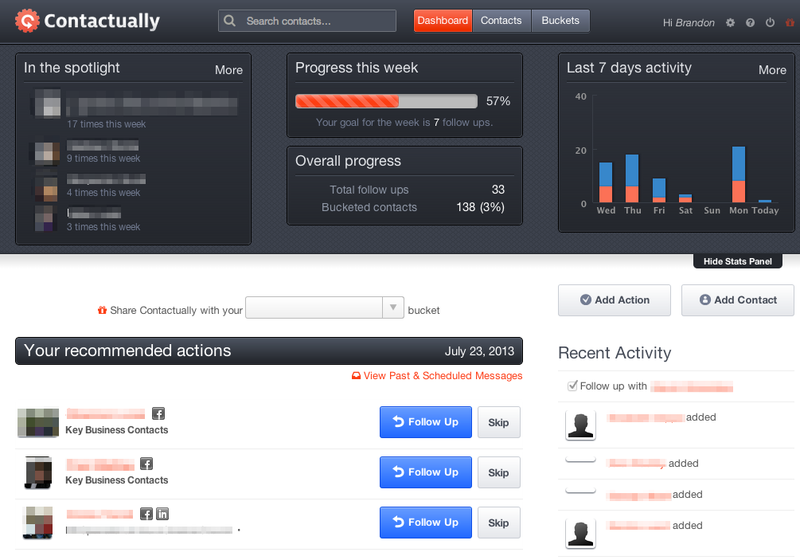 Contactually will email you every day with a list of people to contact. You can do stuff like set up message templates, email up to 50 people at a time (up to 300/day) and introduce your connections to each other through the platform. I have to say—the daily reminders have been huge for me (they are habit-forming) and have prompted me to stay in touch with a wide range of people in my network. I typically get very fast, positive responses in return. Another great feature is a weekly summary of all your email activity, showing you at a glance how many emails you sent and who the top people you emailed back and forth.